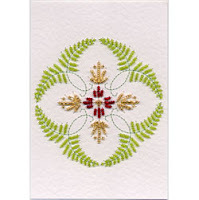 Well this is a fabulous tutorial and uses Fern Stitch which I have shown on here before, this stitch is not used enough really. cases or collars. It shows you how to make something that is plain more detailed and stunning and a little special. I hope you enjoy this embroidery tutorial and have a wonderful weekend. Diaries at the ready ladies and gents!